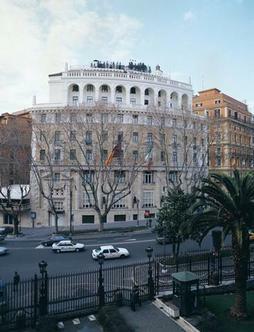 The Palace is a stately and elegant hotel built in the twenties by prominent architect Marcello Piacentini in the popular Via Veneto, just a short distance from the Spanish Steps. In its elegant lobby it hosts the original and spectacular frescos of Cadorin, one of the most famous Italian painters. An entirely remodeled interior, fine d?cor, exquisite furnishings, splendid rooms with balcony, outstanding service, excellent food and drink and the latest technologies are just some of the special comforts and features that make every stay at the palace truly memorable. To business travelers, the hotel palace offers the most modern equipment in a luxurious setting, the advantage of a functional and elegant spa, to be very central located/the best place to meet your business partners.